Happy valentine’s day, everybody. Here’s a love story for you. Once there was a person named Claire. She was skinny and odd-looking with wispy blond hair, and she dressed like an old blues musician. An old male blues musician. She was twenty-three, but she didn’t know what that meant, the foolish child, because she’d never been forty-three yet. In May spring came to her dirty little city just as it came to all the greener and pleasanter places of the world. Claire walked around town constantly, and she loved the hopeful light, and the warm, sweet air, sweet with more than the fumes of the local candy factory, this time of year. And she started to notice a boy named David. He was a strapping fellow, with sideburns and doc martens and huge blue-green eyes with gold in the center. She started to see him everywhere, and she talked to him, from time-to-time, when circumstances and her wildly beating heart allowed. He didn’t seem all that interested, but she was fairly persistent, and one evening her mischievous roommate, Big Dan, to Claire’s terror and delight, asked David if he’d like to go on a bike ride with them next morning. They went to a towpath, with fields stretching for miles on either side – fields awakening with spring, fragrant with grass and wet dirt and expectation. They couldn’t know that this towpath connected, miles and miles away, with one that they would live along in their own house, with their own family, years from now. David didn’t need to be the fastest or ride the farthest, and he noticed everything – the turtles and frogs and snakes. The trees were full of birds, bright tanagers and warblers and orioles, singing their hearts out. But David and Claire didn’t know that, yet. They did not yet recognize the songs, or know to look for the sweet swift movements in the shifting leaves, just as they couldn’t know about the hours and days and years of love and joy and pleasure they would share, or of their own two bright boys, who would run along the towpath, singing their hearts out. They couldn’t know that yet, but it was there. That very night, Claire went to a party at David’s apartment. He stayed by her side the whole time. He said, “Do you want to see the art?” and laughed, but there was art, everywhere. And his room was like a museum, full of odd and interesting things. He was shy, but never awkward. He didn’t talk much, but what he said was always thoughtful or witty. A drunk Russian boy fell down in the kitchen, and a Joycian scholar took umbrage when Claire described Joyce as an awkward adolescent. At 3 am, David walked Claire to her car. They looked for Orion in the sky, but the hazy warm lights of the city obscured the stars. David said I bet we could see Orion from the field by the towpath. Claire drove through a red light on the way, and didn’t even notice. David laughed and said, “no cop, no stop.” At the field they joked about ghostly deer. David asked if Claire saw any shooting stars. She looked up in the sky and a star shot across it. The first she’d ever seen. He asked if she saw any more, and she saw another. David, who was quite a bit taller, lifted her off the ground and kissed her. Years and years later, Claire, who never stopped thinking and never stopped talking, pondered the appeal of Jane Eyre and Pride and Prejudice. Why do we get so much pleasure from reading and re-reading these romances with happy endings? She asked. Well, you’re living in one, said David. And day after day, year after year, David gratefully and happily ate all the strange food that Claire put on the table. Even if it had odd combinations like spinach, tart cherries and gjetost cheese. Everybody is talking about gjetost cheese, at the moment (or brunost if you prefer) because its publicist wisely had it catch on fire by the truckload in a tunnel. It’s a dense sweet, caramelly cheese. I’ve heard it described as having umami flavors, and it does. It’s very intensely weirdly wonderful. It takes a bit of getting used to, but it’s oddly addictive. 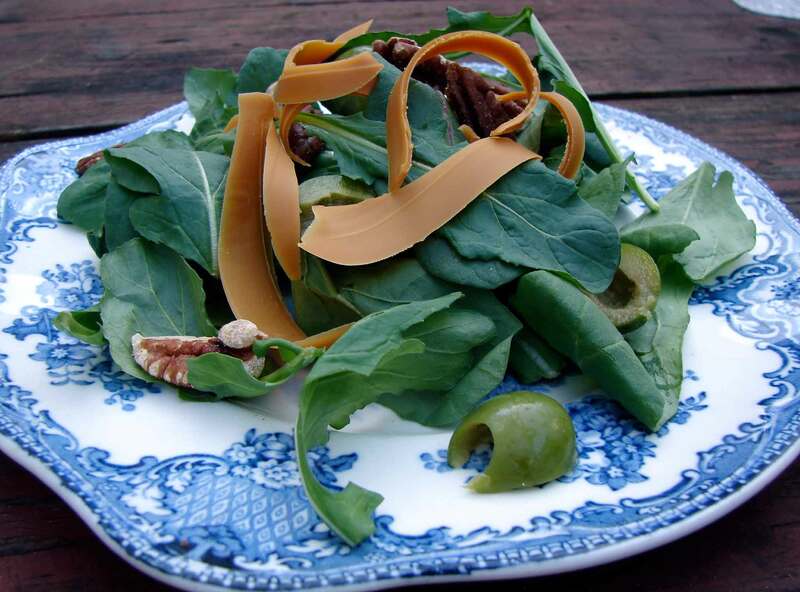 The first time we tried it, we paired it with salty bright castelvetrano olives in a salad with arugula and pecans. Nice. The next night I made crepes and filled them with spinach, tart cherries, and a combination of sharp cheddar and gjetost cheese. An odd combination, but I liked it! I love greens with raisins, so I thought cherries would be a sort of logical next step. And the caramelly gjetost went nicely with the browned-butter flavor of the crepes. And that’s that! Here’s Mellow Mood, by Bob Marley. It’s our song. Whisk the eggs and milk together in a large bowl. Add the dry ingredients and whisk until the batter is lump-free. In a large flat skillet over medium heat, melt the butter. Put a ladelful of batter in, and tilt the pan so that the batter goes in a thin layer to the edges. When it starts to look dry on top, flip and cook on the other side for a few moments. Stack the crepes on a plate and keep them in a warm oven until you’re ready to use them. Warm the olive oil in a large frying pan over medium heat. Add the garlic, pepper flakes and herbs, stir and fry for under a minute, then add the spinach and a spoonful of water. Cook until the spinach is wilted but still bright – it should only take a minute or so. Transfer the spinach to a bowl and add the cherries, pecans and grated cheese. Mix well, and season with salt and pepper. 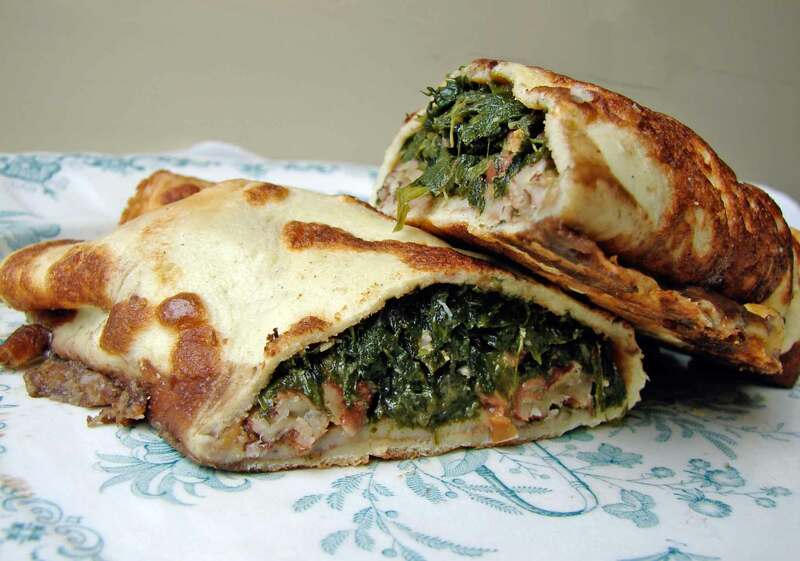 Fill each crepe with a heaping spoonful of filling, and roll the crepe around it. Place the crepes seam-side down in a lightly buttered baking dish. Bake for 20 – 25 minutes, until they’re hot through, and the cheese is melted. This entry was posted in recipe and tagged brunost, gjetost cheese, savory crepes, savory sweet combination, tart cherries by Claire. Bookmark the permalink. Sweet story, steenbeck! Happy Valentine’s Day to you and David. ANd to you, too, TFD! Yes we do have Trader Joe’s out here. I will go look, and I will look at your suggestions. I love your blog! Again you are a writer, and your stories are interesting. I hope you are getting $$ for posting, you need sponsors. I live 50 miles north of San Francisco, CA. in the beautiful wine country. Today it is beautiful out. We get heavy cold frosts at night in winter. I think Spring has sprung. I am sitting on my deck watching golfers go by our home, and thinking of your crepes. How many tarts does this recipe make? I want to try it out for an appetizer for a wine group. Could cut them into bit size pieces. Let me know your thoughts on this idea. Me again…Do you think this filling would work in a tart? Spinach on the bottom, Tart cherries, then pecans and top with the cheese? Always looking for appetizers that are different. I am not familiar with GIETOST or BRUNOST cheese here in Untited States, California. We have MANY cheeses however. I will look online to see what you are suggesting. Meanwhile if you have an idea let me know. Gearing up for this Mardi Gra party on Saturday night. But you might want to increase the amount of spinach (and everything else!) in the filling. Or maybe round it out with some ricotta and an egg? What a sweet story. 🙂 And these crepes are Exactly my speed for valentine’s day–or really for dinner in general. Must make a bunch and stuff them with everything in the land. What a lovely story, and recipe! Thanks for sharing! What a lovely place for a first kiss… MummyP’s and mine was in a cinema car park by the motorway ! What a beautiful romance. You brought it to life with your writing. Thanks so much. It was a fun time! It’s strange to think how long ago. Twenty years! Wow.